On a January 11, 2002 linkinpark.com chat, Mike Shinoda revealed Aaron Lewis would be on his "Crawling" remix on Reanimation: "do you guys want to know my secret about my remix for "crawling"? big news for those that like his band... aaron lewis from staind sang on my remix for crawling that guy is a very talented individual"
The remix was created by Mike Shinoda and features guest vocals by Aaron Lewis of Staind. 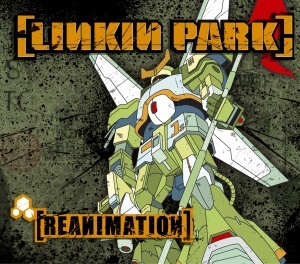 According to Mike, the song was a big challenge for him and was the most difficult of all the tracks he worked on for "Reanimation". All the music was created by Mike and he also wrote the string arrangements, which were played by Phoenix on violin and cello. Mike described the remix to MTV, saying: "I usually like to make really dramatic songs [that are] dynamic from part to part — a lot of jumping from really quiet to really loud. And this song is pretty much a five-minute build to a crescendo and then it ends. It’s really smooth. There’s a lot of dark soundscapes created by the samples and the strings together." Aaron's vocals were recorded during the Family Values Tour, between October 11, 2001 and November 17, 2001: "It was ridiculously easy because he liked the vibe. His voice is just amazing. Aaron came in and heard it and sat down and recorded his vocals in probably a half-hour. He comes to our bus, records it and leaves. I felt like it should have taken longer. I’m like, ‘Aaron, come back…’"
Speaking to LP Underground members about the remix in 2002, Chester Bennington said: "we've created something different then what already existed the vocals didn't change as far as my performance but it was really cool because i agree with you that aaron has one of the best voices it's really exciting to hear our voices together they blend really well and he does some really cool harmonies it's one of my favorite tracks on the remix record"
The music video for "Krwlng" was directed by Jonathan Ruppel for MTV2's "MTV:Playback". MTV: Playback was originally aired on July 27, 2002 at 2:00pm, with a rerun on July 28, 2002 at 8:00pm. Features vocals by Aaron Lewis. Violin intro and outro is absent. No live strings by Phoenix over the top of Mike's programmed strings. Louder bass beats in the second verse. Different effects on Chester's vocals. Released on LPLive for free download on March 21, 2013. "Krwlng" has never been performed in its entirety. However, throughout the Meteora and Minutes To Midnight touring cycles, it was prominently used as an extended intro for "Crawling". On Projekt Revolution 2008, Mike began to rap the first verse of "Hands Held High" over the "Krwlng" instrumental before performing "Crawling". In 2009, Mike continued doing this, but eventually shifted over to rapping the second verse of "Hands Held High" over the instrumental, rapping the first verse a cappella style. This page was last edited on 6 August 2018, at 12:10.